The Matterhorn (Cervinia in Italian) although the most famous is not the highest mountain in the area. That honour belongs to the Monte Rosa. 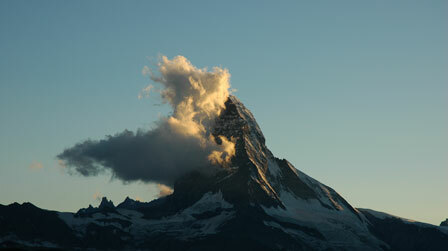 Altogether there are 41 peaks over 4,000m around Zermatt. Time does not normally allow us to climb any (although you may as an Extra or Add On); we tend to stay in the high alpine pastures below the highest peaks admiring the views and soaking up the sun. We do not normally climb above 3,100m, high enough to feel the effects of the altitude and thin air. The Alps are the result of the Alpine mountain building period which saw the collision of the African tectonic plate with the European plate. The complexity of the geological folding and faulting processes can be gauged from the fact that the rocks forming the upper part of the Matterhorn are of African origin.